Tox Town received four stars in our Best of the Web list. Learn more about Tox Town and other websites below. Check out these websites from GEN’s Best of the Web. The Internet is a big place; when you’re looking for biotech-related websites, where should you start? At GEN’s Best of the Web, of course! Every other issue, we bring you a list of the best biotech- and biopharma-related websites we think you, GEN reader, would find useful and/or interesting. Here is our list of the Best of the Web from our June 15 issue. Enjoy! Tox Town—doesn’t really sound like a pleasant place, does it? Well, if you take time to explore this website by the U.S. National Library of Medicine you’ll discover that we all actually live in Tox Town, surrounded by health hazards and toxic chemicals. 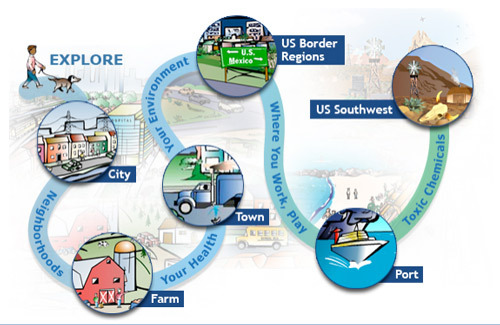 Site visitors have the opportunity to explore six different environments, which each come with their own health hazards: city, farm, town, U.S. border regions, port, and U.S. southwest. 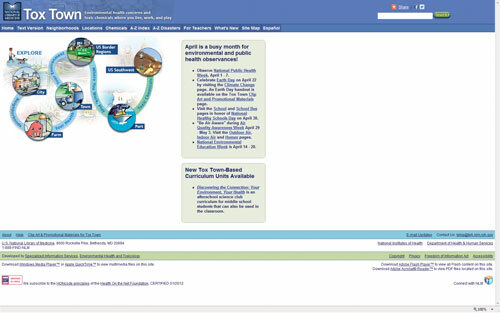 With its colorful graphics the website appears, at first glance, to be directed exclusively to younger children; however, though the site does include teacher resources and can be used with students across a wide age range, the material presented in its full form is directed to a wider audience. This is evidenced by the fact that upon clicking each animated graphic, the site visitor is directed to information from sources such as the Environmental Protection Agency’s website. 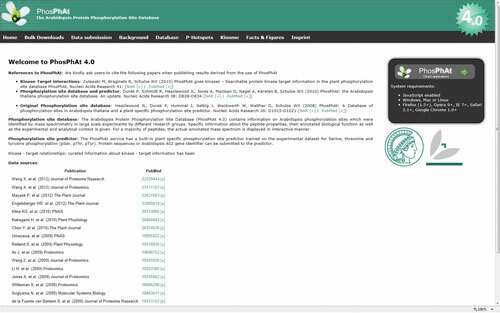 IntAct is one of the many wonderful and freely available resources through EMBL-EBI. (The people at EMBL-EBI really do make biologists’ lives easier, don’t they?) IntAct is a database of molecular interactions, as curated from the literature or submitted by users. 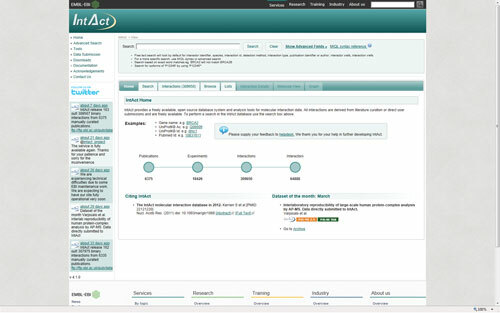 Users can search the database in a number of ways by entering the molecule of interest, species, interaction ID, detection method, or interaction type, among other options. The results list for each query includes the number of interactions found (specifying whether they are binary or were identified by a method that detects more than two binding partners), the specific interactions, and the method of detection (such as anti-tag coimmunoprecipitation). Clicking on a specific interaction pairs pulls up additional details about it. Users can also view and download the results in graphical form. The laboratory of Feng Zhang, Ph.D., at MIT has quite a nice website—and a useful one, too, if you are in the market for genome engineering resources. 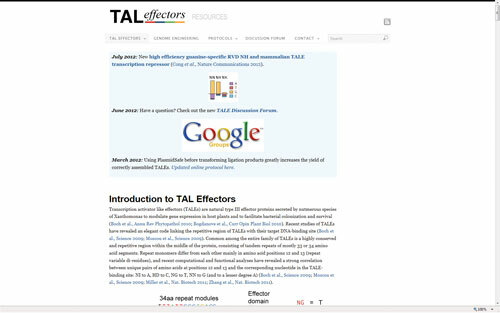 In particular, the TAL Effectors Resources page provides useful information for researchers interested in using (or who currently use) TALEs. TALEs are Transcription Activator Like Effector proteins that recognize specific sequences of DNA, and which have been custom-engineered to recognize DNA sequences of interest in plant and mammalian cells. The TAL Effectors Resources page not only gives an introduction to TALEs, but also describes two of the applications to genome engineering: TALE nucleases (TALENs) and TALE transcription factors (TALE-TFs). The protocols page of the site provides detailed instructions for assembling designer TALEs, complete with a reagents list. There are also links to other TALE-related sites. 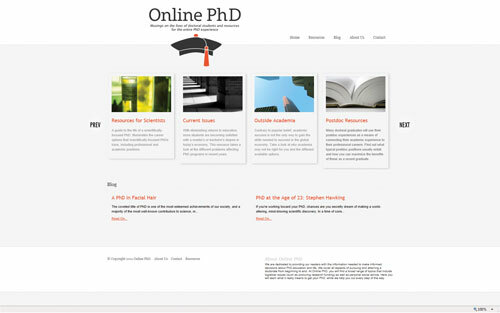 Whether you find yourself contemplating going to graduate school to earn a science Ph.D., are in the thick of your Ph.D. work already, or are a postdoctoral fellow, Online PhD has a number of resources that are pertinent to you. The website brings together a large amount of information collected from a variety of sources in order to help site visitors navigate the entire Ph.D. process. The site’s content is broadly organized into eight pages on the site: resources for scientists, current issues, outside academia, postdoc resources, employment and tenure, professional skills, organizations, and Ph.D. blogs. While not all of those topics (or even getting a Ph.D., for that matter) are unique to science, the website and most of the resources are geared toward scientists. These resources include everything from articles on topics such as mentor-mentee relationships and work-life balance, to links to job-listing websites. Antibodies are notoriously finicky, leaving many researchers to wonder, “Has anyone ever gotten this to work in the first place?” The answer to that question, of course, can be found by searching the literature for relevant citations… Or, alternatively, you can click over to CiteAb, a recently launched antibody database that is self-touted as “the world’s most comprehensive antibody search engine.” CiteAb delivers precisely what its name promises: when one searches for a particular antibody, he/she receives a list of all of the companies that make that antibody, as well as a list of citations for publications in which each company-specific antibody was used. 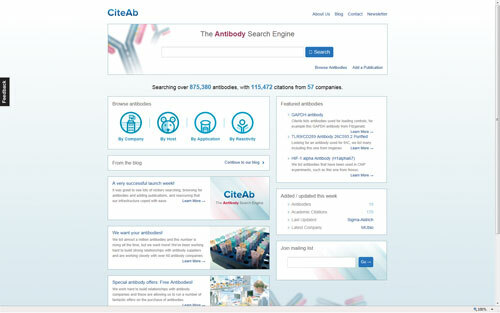 Thus far the site boasts a database containing close to 900,000 antibodies and more than 100,000 citations, so clearly the citation resource exists for some but not yet all database entries. However, with the “add a citation” feature, hopefully more researchers will help to annotate the entries in order to truly make this website a top-notch reference. For researchers out there who study Arabidopsis protein phosphorylation, the PhosPhAt database is an invaluable resource. PhosPhAt is a searchable database of—you guessed it—phosphorylation sites, as identified through a number of mass spectrometry experiments. At present, PhosPhAt includes experimental data from 24 published studies, so there is a lot of depth to the database. The database itself is accessed via a Java application (compatible with Windows, Mac, and Linux), and is searchable by protein (AGI) codes, peptide sequences, or protein descriptions. In addition to the basic phosphorylation site search, users can also search for kinase-target interactions or use the phosphorylation site predictor feature. The website is nicely organized and the Java app runs smoothly. PhosPhAt is a very nice resource for plant biochemists. Want more Best of the Web? Click here! Also, to suggest a website for Best of the Web, please send the URL to Taralyn Tan (ttan@GENengnews.com).